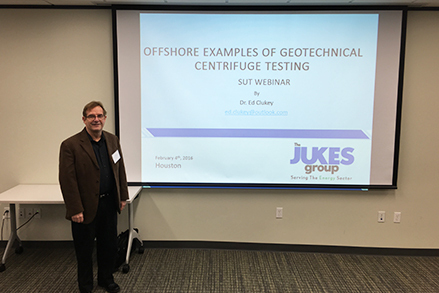 Dr. Ed Clukey (Ph.D., P.E., F.ASCE., D.OE, D.GE), of The Jukes Group, presented on ‘Offshore Examples of Geotechnical Centrifuge Testing’ to SUT International Webinar and Learning Breakfast. Dr. Clukey covered various aspects, from his 40 years of experience, to a room of industry experts in Houston. Dr. Clukey is a World leading expert in his field, and has made a significant contribution to the Oil & Gas Industry throughout his career.